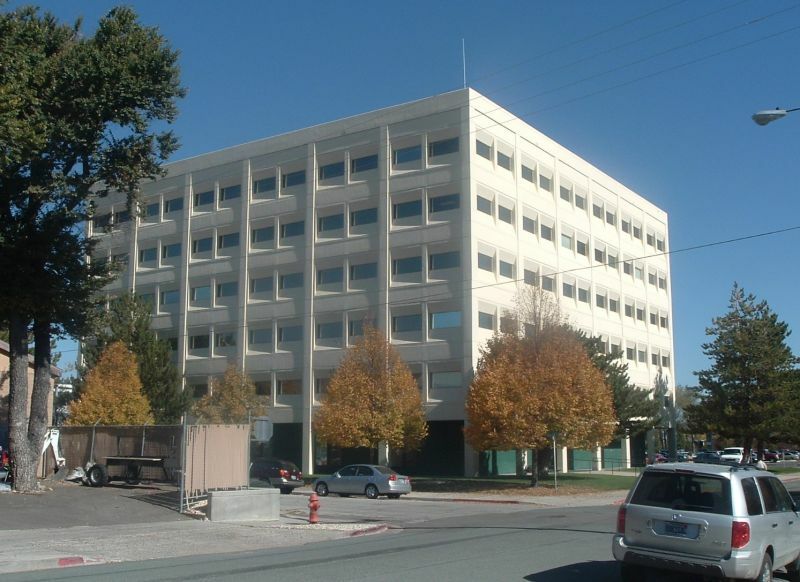 The Kinkead State Office Building is one of the tallest and most visible buildings in Carson City. Its white walls and wide rectangular windows stand out over the treetops as you’re approaching town. Its six floors hold tens of thousands of square feet of office space, and several state agencies call the building home. The ventilation system isn’t adequate for a building of this size. At one time, none of the windows were weatherproof, and you could feel wind and rain coming in through the cracks. It ran into foundation problems almost immediately, and some parts of the building have settled faster than others. This has caused the floors to sag so badly that balls roll across the room by themselves. Workers are developing back problems because their chairs won’t stay still. The concrete beams are riddled with cracks, and chunks of concrete have broken free and fallen. Some of them have almost fallen through the ceiling tiles. Fire officials recently found about 400 safety violations. Engineers have found the building would collapse in a moderate to strong earthquake. When a mild earthquake hit in September 2005, workers rushed to the exits and waited outside to see if an aftershock would bring it down. A supervisor came by and told them this time would count against their break. Most of the people who work in the Kinkead Building want to move out. The former head of the Buildings and Grounds department wanted to have it condemned. Even the governor wants to see it go. But the problem is the State Legislature. For the last two legislative sessions, money has been earmarked to go to the construction of a brand new office building, a twin to the Bryan Building that just opened this year. This new building would house all of the agencies that are currently in the Kinkead Building, as well as consolidating a number of smaller offices that are scattered around the city. But, for the last two sessions, that money has been yanked and sent to other projects instead. This year it went to UNR so they could have a new math building. But, the problems of the Kinkead Building are too great to ignore, so something else had to be done. So even though there is no money for a brand new building, the state will be abandoning the Kinkead Building anyway. A plan to relocate the agencies to new digs was approved on November 9, 2005, and the move should be completed by the spring of 2006. After that the Kinkead Building will be “mothballed”, which I suppose is the new term for condemned and abandoned. Hopefully at the next legislative session in 2007 the money will finally be made available to knock down the Kinkead Building and get work started on its replacement.